My mother is 81 years old and can still quilt like this - something ot aspire to. She just gave me this quilt just because I needed a quilt this size for my wall. It is beyond gorgous! We quilters show our love through the giving of our quilts. I am obviously loved very much and grateful to still have my mom in my life. She is my hero. All the stems and flowers are needle turned applique - amazing! I love it - thank you Mom! I saw this technique for making stones in quilting arts magazine and am having fun with it so am sharing it with you. It's a good take along project. Cut out a rock or stone shape from the peltex/ batting and lay on a batik. Cut around leaving a good half inch all around. Do a running stitch all the way around and then pull to gather. I then anchor it even more by sewing from side to side as above pic. You probablly don't have to go this far but I like things to stay so that's what I've been doing. I'm leaving today to go camping so have prepped a bunch and used my ever fabulous wonder clips to keep them together till I'm ready to sew. Now all I have to do is whip out my Baggie and I'm ready to go. Yes it does take awhile but I like to have a hand project going at all times. Not sure yet what I will do with them but there are endless possibilities here. I've been getting my quilts ready for the fair today - listing labeling - very boring. I needed a play break so decided to try quilting what looks to me like a mum that originally caught my eye on Facebook and I apologize to the maker of it for not getting her name. Isn't it wonderful? Granted my little 20 minute job isn't this great but this inspired me. The other day I drew this out to see how it goes. So I cut a little square of fabric and layered batting and backing. I figure I can add some borders and make a mug rug or something. The end isn't important here it's can I do this? Start with that middle 5 petal thing, then travel up to the middle top petal of one of them (see the top middle arrow) then simply go around, bouncing off the middle of each petal. I then went over it again and added little vein things in the petals. This literally took me 20 minutes tops. I'm almost done with "soothe your soul" there is nothing better than talking a walk and seeing and breathing nature. It soothes my soul. I've seen more and more of these little cairnes or rock sculptures popping up everywhere. Seeing them soothes my soul. So thus the name. The rocks I made by cutting out rock like pieces of peltex, layered batting for puff and then cut the batik fabric a half inch or so bigger. Ran a gathering running stitch around the outside edge and pull or gather to enclose. They are then appliquéd to the background. Bits of hand dyed wool roving are stuck in here and there as well as little pieces of found driftwood after drilling a couple of holes to tack them down. The background fabric was perfect as is so I just painted on a moon and reflection. The words caused me some problems though. First I printed them out. My plan was to mod podge them onto the base stretched canvas. But I just didn't look right. I thought white on the dark purple/black background would look better. But how to do that? I have no white markers or sharpies. Do they even make white sharpies? My brainstorm came up with a whiteout pen. This is my practice paper and it's a good thing I practiced first. The white out pen was hard to control the flow of white out (paint) it came thick then turned thin or stopped in the middle of writing. So I shelved that and tried a silver paint marker I had but that was to thick. These words have to be pretty small. So I wound up using a felt tip blender pen and dipped in some white acrylic paint that had half dried up so it was fairly thick put still usable. I first used a black, magenta and periwinkle marker on the paper for background and wrote the words on the paper. Then cut it out and mod podged it on the canvas. It works but would be better to have used something to write directly onto the canvas. Does anyone have any experience or ideas on how to do writing in white on a dark background? Can I come out to play? A sad yellow lab only able to stick his nose out of a hole in the fence - let him out to play! 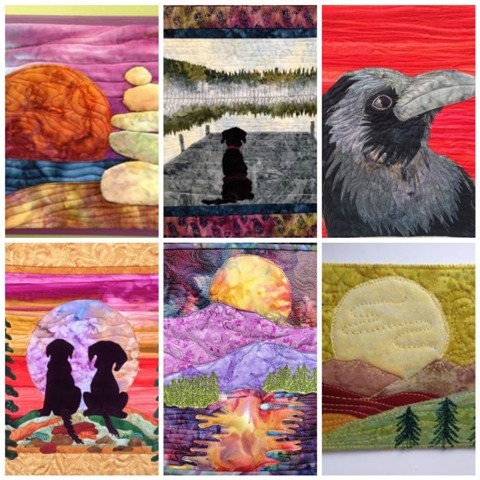 This bit of quilted fabric art was made in March and I'm entering it to the pets on quilts linky party under the dog themed quilts. There are 10 photos here so if your browser is slow, sorry but I wanted to show the process. I started out with the nose, traced the basic lines and quilted with black thread. Then with colored pencils started to color. The nose was carefully cut out and put with wood fence looking fabrics, trouble with the top of the nose though, it just stops .......... Hmmmmmmmm. Tried adding more fence to cover - nah! So I added a chunk of nose, colored it and quilted it - yes! Woof! Woof! - happy tail dance!